When situations are adverse, it is well worth remembering that they may very well be what we need to accomplish our purpose or that we can reach our goals in spite of them. The opposing circumstances often tend to stretch us to dig within ourselves and find resources we didn’t know we had or, if we remain dogged, to find those resources someplace outside of us. I felt that designing this card will help you see the truth of this saying and have it etched in your memory. Stay focused, hang in there, and most importantly put God in the saddle, and you’ll ultimately have a story to tell to the glory of His name. Follow edithohaja.com for more inspirational, educational and entertaining articles, poems, quotes and graphics. You can also connect with me via my Facebook page (facebook.com/auntyedith), LinkedIn, Twitter, Google Plus and Instagram. Jesus is Lord! I love that quote. Henry Ford says it all. Thank You Aunty Edith! 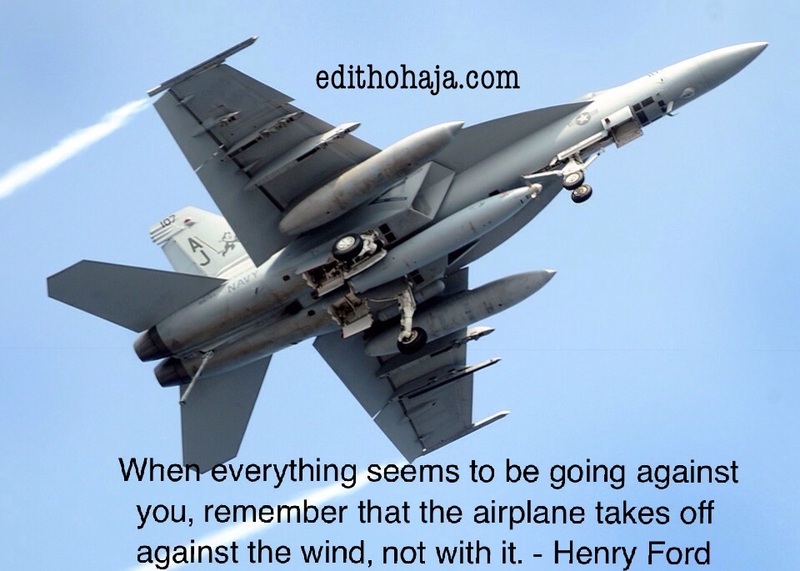 i luv the part which said that planes take of against the wind, not with it. Yeah, I didn't know that until I saw this quote. Bless you! I believe in these three- Faith, Patience and Hard work. These are the virtues of a winner. Faith in God that he knows what u are passing through and that he exist and truly cares, Patience in your prayers hoping that the time is not yet come but that certainly it will... and putting your all as human to savage your situation. St Paul proclaimed " faith without work is dead." God is not a magician, this is what a lot of us fail to understand. Situations can turn bad or even worse but thats not the end of life thats why it is necessary we commit our ways into the hands of God and even when things gets bad, we should pray and be strong and believe its going to be okey, bless you ma. As individuals we tend to face challenges in life. We should be prayerful and dependent on God for everything and in every situation we find ourselves. No cross no crown ,the saying always go since suffering is part of human life; no Matter how bad enduring situation gets, one should always know that he with God is a majority and that's why one should commit his way into the hands of God. Bless you ma. True!! Tenacity with purpose equals success. When God is the master of that purpose then nothing can stop you from reaching your desired goal. When things go against us, then that's an opportunity to push forward and succeed. There are times we feel like certain situations/ challenges are above us but that is when we are supposed to push forward, pray and seek for positive means to solve our problems, not giving up. Be persistent in whatever plan one has for oneself. And also with the help of God and putting him first one will ultimately have a story to tell. That time that things start getting harder, just know that that is when it is about to yield to your strength so do not give up. there is really no labour without favour,no guts no glory. to make it in life one must burn the bridge nice post man. Burn the bridge? I never heard that one before. Lol! tenacity involves desire,decision and focus for one to succeed,there may be problems but striving to succeed pays. Tenacity embodies curiousity,deligence and determination .it comes with responsibility and maturity. tenacity revives and restore fulfillment in anything successful and accomplished in our life but it does comes with sacrifice,passion, devotion,zeal,determination and most especially God factor to achieve something meaningful in life.